We’d love your help. 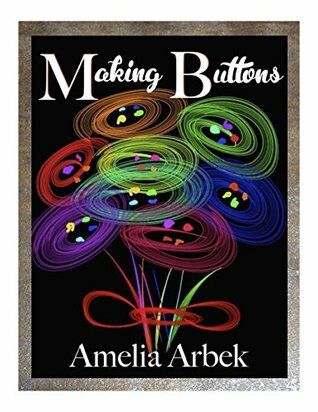 Let us know what’s wrong with this preview of Making Buttons by Amelia Arbek. High school sweethearts, Charlie and Jo Marie, are in love. But when Charlie walks away from Jo Marie, seemingly inexplicably, she struggles to understand how things could have changed so quickly. She holds out hope that he will come to his senses and return, but when he doesn't, she moves on, albeit reluctantly. Years pass, and Jo finds herself struggling through the day to day of a loveless marriage. Determined to make it work, she does whatever she needs to in order to keep her marriage even keeled. Until, that is, she is faced with a decision that challenges her values to the very core. For the first time Jo stands her ground and makes the only choice she knows she can live with, which isn't accepted by everyone in her life- namely, her husband. She has to figure out how to explain to a recently returned Charlie Anderson why she named him as the father of her baby. Making Buttons is a full-length, stand-alone novel, filled with all the angst, laughs, frustration, and satisfaction you expect from a heartfelt contemporary romance. To ask other readers questions about Making Buttons, please sign up. There is nothing I love more than a great second chance romance and “Making Buttons” has all of the ingredients to make my heart flutter. Jo Marie and Charlie’s characters were so well written that I fell into this story with my whole heart and couldn’t wait to turn the page to see what would happen next to this couple. Just when you think things are going to work out with them…another problem arises to be worked out. I will have to say though that I honestly started to hate some of Jo Marie’s family for how negative and closed minded they were to the problems she had with Oren (her ex husband). There were so many jerks in this book, especially to Jo Marie, that I just wanted to take her and give her a hug for strength. Oh, and yes, there was a time that I really thought Charlie was the biggest jerk for what he did to Jo Marie and thought there wasn’t any excuse to how long he waited…but as the story goes on, he does redeem himself in my eyes. Jo Marie and Charlie were in a relationship in high school until Charlie takes off and breaks Jo’s heart. Years go on and Jo Marie ends up getting married but finds herself in a bad relationship, pregnant and decides to leave her husband and go home. Little does she know is that Charlie for the first time in many years returns home to start his life. The story revolves around these two while they fight to make things right again. Making Buttons by Amelia Arbek was a great surprise! It has a bit of everything including a refreshing plot and great writing style. And as I found out, “Making Buttons” is the term used when worrying yourself sick basically! The only downside is this was a very long book which could probably have been cut to half if the descriptive text wasn’t so excessive. I really struggled in parts and found myself skipping pages which I never do. What happens when your first true love, the love of your life, the one you planned your future with, ups and leaves you without an explanation or a second glance back? Struggling to come to terms with the fact that Charlie left and finally realising he wasn’t coming back when he didn’t show up for her graduation, she spent the next few years moving through the motions of life, attending college to get her teachers degree, getting a job at a local school and occasionally hanging out with her best friend. She went on a few dates but nothing ever eventuated…Charlie had stolen her heart and in the process, left her broken. The past few months she noticed Oren had been acting differently and seemed to be distant and cold toward her. Being Jo-Marie was Italian, and having been brought up in the traditional sense, Jo-Marie stuck it out and tried her best to make the marriage work. When Jo-Marie announced to Oren she was pregnant he lost his mind and told her she was to consider an abortion, as he didn’t want a child, it wasn’t in the plan! Leaving her husband she went back to her childhood home, much to the disappointment of her family and announced to her friends and family she was pregnant to her ex! Although she didn’t name names, everyone knew Jo-Marie only ever had one previous relationship before her marriage, but let them wonder, it wasn’t like Charlie would ever know what she wrote anyway? After turning his back on Jo-Marie 8 years earlier, Charlie had lived every single day regretting his decision and torturing himself over the loss of the love of his life. He had returned to his home town on occasion where he would secretly follow Jo-Marie just so he could get his fill of her. Now back home for good after doing 8 years of service and getting a qualification which would see him be able to start his own business and not be the guy with no future he was destined for and everyone presumed he would be, he found himself being congratulated on the expectant arrival of his child by passer-by’s as he walked down the main street…what is going on? Although you can probably guess what is going to happen, Arbek threw in lots of twists and turns which made this book a game changer, catching me off-guard and being anything but predictable. With all the goings-on and antics between Jo-Marie and her siblings, including Gaetano, Jo’s older, very protective brother who was pretty broody to say the least and who probably deserves his own story at some stage, and her mother Lina…so traditional in the way she raises the kids, strict and no-nonsense, but nothing but unconditional love for her children nether less, had me laughing out loud. Reviewed on behalf of 2 girls who love books blog. I really enjoyed Making Buttons by Ameila Arbek. It was full of emotion, had a great storyline and some really great characters. I have to admit when I first started the book and read the note from the author about some of the content I almost didn’t read on for personal reasons but I am so glad I did. The title of the book ‘Making Buttons’ is referred to quite a few times and it takes quite a while before you actually understand what it means but once you do it makes you think. I’m pretty sure I make buttons myself! The story is about Josephina (Jo Marie) and Charlie who were childhood sweethearts until one day Charlie left Josephine broken-hearted. They see each other again 8 years later but for Jo Marie especially so much has changed in those 8 years. standing her ground even if it meant other things had to go in her life. I think it was pretty clear from the moment that Jo Marie and Charlie saw each other again that their love had never gone away and even the 8 years apart had not dampened the chemistry that was between them. I thought Charlie was a great character, he honestly loved Jo Marie with all his heart and he did think he was doing the right thing by leaving her when he did. With everything that he does in the story it’s blatantly clear that it’s done with her happiness at the forefront of his mind. A real genuine person and I loved him! ARC Review on behalf of the Emergency Book Blog..
Making Buttons is a sweet second chance romance; Charlie and Jo are high school sweethearts and very much in love. She thinks they will be together forever; but Charlie has other plans for the future. Distraught for a what seems like forever Jo finally moves on with her life; meeting a man and that turns out to be something other than what she thought. She lives her life as a doormat always caving just to keep the peace, but when a life altering s ARC Review on behalf of the Emergency Book Blog..
She thinks they will be together forever; but Charlie has other plans for the future. Distraught for a what seems like forever Jo finally moves on with her life; meeting a man and that turns out to be something other than what she thought. She lives her life as a doormat always caving just to keep the peace, but when a life altering surprise forces Jo to grow some balls she makes an announcement and a decision that leads her back to her hometown and much to her surprise...Charlie. Charlie has only ever loved one woman. 8 years ago he made the decision to better himself. A decision that took him away from his hometown and the love of his life. When Charlie returns home he is blindsided by congratulations and anger for something he knows nothing about. Can he figure out what the hell everyone is talking about? Will he be happy when he gets his answers? Can two people that have been so far removed but never apart, find one another again? Can so much hurt be forgiven and forgotten? I laughed, I cried, I made buttons. Charlie Anderson sacrificed everything to become the man he needed to be to provide the life he wanted for the love of his life. Josephina Tedeschi (Jo Marie) picked up the pieces of her broken heart and made herself move on. The pull of their love was felt throughout the story. The desire was palpable between Charlie and Jo Marie and their willingness to wait until the right time to consummate their love was admirable. The Tedeschi family members provided great I laughed, I cried, I made buttons. The Tedeschi family members provided great depth to the overall story line. The title was referred to early and often throughout the story. The full explanation of the meaning wasn't revealed until well into the book, which I felt was an odd choice. I am so excited to offer this book to readers. It is a story that is near and dear to my heart, for a few reasons, but mainly because it was inspired by my grandmother. If she were still with me, she would call this contemporary romance a "love story." With hopes that you enjoy this novel, and all of the characters within, I invite you to download Making Buttons. Making Buttons is a Contemporary Romance about love, family and second chances. Jo Marie and Charlie are high school sweethearts but one day he decides to leave town and Jo ends up alone and heartbroken. As times passes and Jo Marie realizes Charlie is not coming back, she reluctantly decides to move on, eventually meets someone else and gets married, but something happens that makes her reevaluate his relationship and go back to her hometown and her family. Amelia Arbek’s gives us good characters Making Buttons is a Contemporary Romance about love, family and second chances. Amelia Arbek’s gives us good characters (some of them like Luca are easy to love) and is interesting to learn about the the dynamic of the traditional italian family Jo is part of. Jo Marie has an older brother (Guy), a younger sister (Giulia) and a younger brother (Luca). Her relationship with each one of them is really different but I found myself drawn to the parts of the story that showed interactions between Jo Marie and Luca, she’s protective of his younger brother and I found him mature for his age (there’s a reason for this but I won’t give anything away to avoid spoilers). My perception of Charlie changed throughout the book and I ended up loving this character; yes, he makes mistakes but he also loves intensely, knows what he wants and is really persistent. While I was reading this book I thought the story was going in a direction and then suddenly there were some twists that I definitely didn’t see coming but were interesting to read. This story shows how true love can last, in life heartbreak sometimes happens, you can experience some regrets but at the end fighting for what you want is worth it. I liked this book and if on the future Amelia Arbek writes a short story or a one-shot about Luca and Grace I would absolutely love to read it (Luca and Charlie were my favorite characters). Making Buttons by Amelia Arbek is really great second chance romance book. The story of Josephina (Jo Marie) and Charlie is full of emotions and their journey had me hooked from the very beginning. You will have all the feels of first love and all the heart ache that goes with it. This amazing story shows love can and does win in the end. I thoroughly enjoyed Making Buttons. The characters are humanly flawed and relatable. I especially like the enduring nature of love and family that is portrayed and also contrasted with what often masquerades as love: fake, self-centered, and abuse. Due to the busy and chaotic life she leads, her main source of sustenance tends to be coffee, with espresso coming in at a close second. Jacked up on caffeine and chocolate-vegan-scones from Whole Foods, her goal is to take her readers on a character driven, heartfelt, and deliciously sweet ride.